Welcome back. 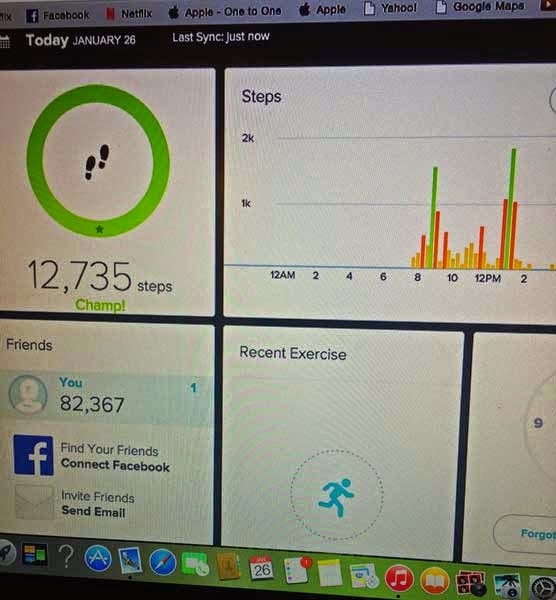 Today’s blog post concludes the post by Sharon F. that began last Friday (Stepping into Fitness, Part 1). Day 1: After many attempts, I finally managed to attach the monitoring device to my wrist. I thought this should be enough to burn a few calories and earn some steps on my tracker. I walked the dog in the morning, went to my exercise class and did my house chores. I walked the dog again in the afternoon for 45 minutes. More house chores and office work, then another dog walk late in the evening. device report for a good day. Halfway home, my wrist started to buzz violently. I thought I was having a seizure or the start of a heart attack! I was fit to be tied, until I connected the device to my phone and discovered that I’d finally achieved 10,000 steps. Day 2: It’s easier to get the device on my wrist, and I headed out for another day of lots of walking. The device can tell me how many calories I’ve consumed and track how many I’ve burned. Too bad I can’t burn calories sitting staring at my computer screen! Late in the evening I felt the startling buzz at my wrist to let me know I’d achieved 10,000 steps. It felt like I’ve walked all day to earn this! I decided to have the device monitor my sleep and tried to activate it at bedtime. Day 3: Couldn’t sleep all night because I was so concerned about the sleep monitor. I walked and walked and kept checking the app on my phone to see how many calories I’d burned and how many steps I’d taken. fitness report for the week. I can’t understand how an hour-long fitness class only shows as 20 minutes of activity on my monitor. Just barely achieved 10,000 before bed by walking around and around my kitchen until I felt the annoying buzz at the wrist. I was determined to use the sleep monitor. 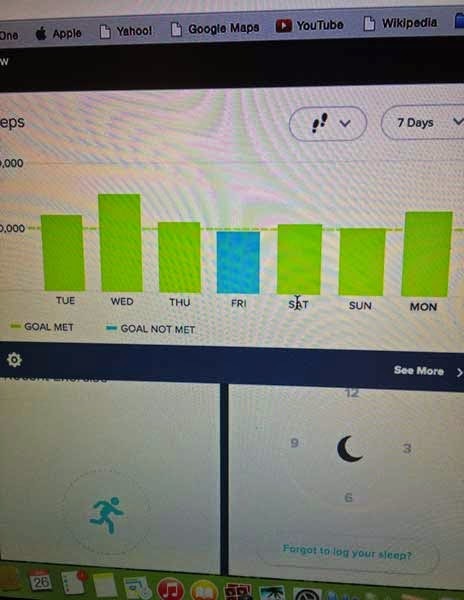 Day 5, 6, 7: I am a master of the fitness monitor, if not the master of my fitness level. It’s fun to see how walking the dog around the block can really burn calories and pump up the walking distance. 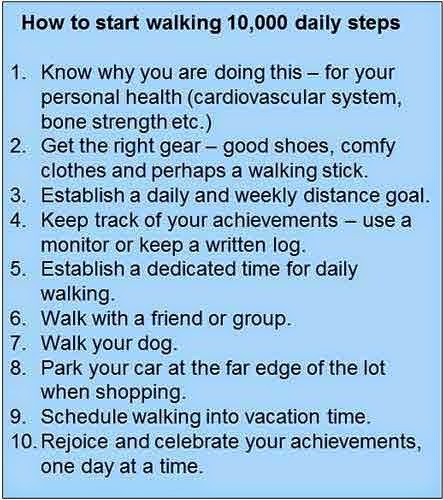 It was easy to have good habits when I was working, because walking was part of my job. Now that I’m retired, I have had to resolve to create new routines and healthy habits. In my new life as a retired person, I’m trying hard to increase my social fitness – meeting new friends at the gym or greeting folks on the street while I walk the dog. I’m helping my brain get fit to learn new things as I figure out the fancy monitor and my new smartphone. I’m walking more and taking careful stock of my diet. I hope there’s a long life ahead of me, and I want to be fit to the finish! Thank you to Sharon for her guest post and to you for stopping by. I hope you enjoyed your visit. Sharon and I would greatly appreciate any comments or emails about the post. You can find other essays by Sharon on the Stage of Life website (www.stageoflife.com), where she posted on the Empty Nest and Retirement Stage under the name Silver Fox.